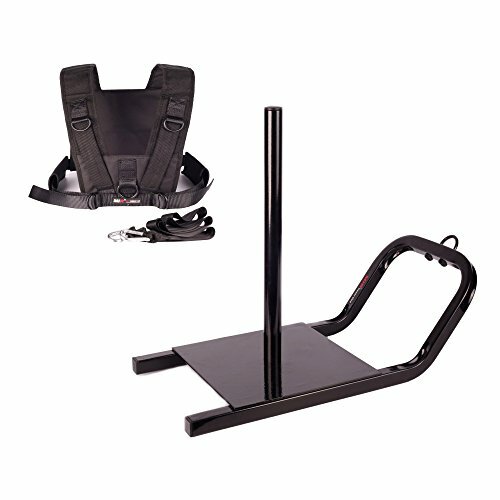 The Mir power speed sled turns your hard work during practice to real time results on the field. It is the 1st choice for training for explosive and intensive speed required in a variety of sports. To use 45lbs plates, you will need to stack smaller weights until the plate can clear the handle bar. Usually putting 2 10lbs plates will give enough room so you can stack the 45lbs without it hitting the handle bar. Push it or pull it, the sled is the perfect training tool for developing powerful leg drive and improving overall acceleration and speed. Using the sled, it will target all your lower body muscles such as the calves, thigh, and quad muscle or target stride length using the belt/harness. By simply add weights to the sled, you will be also strengthening your core while performing short bust training, chest/shoulder press, twists or mimic any activities in every sports. All not only giving you the ability to become more explosive during the game, but also train your full body to exert more force than is needed and thus making your overall speed and acceleration faster overtime. Shipment of the sled can be made only within the contiguous 48 states.